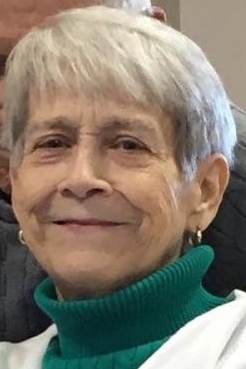 Carol Frances Mendonca, beloved wife, mother, grandmother, sister, aunt and friend passed away peacefully in Danbury, CT on Sunday, November 11, 2018 after a long illness. Carol was born in Yonkers, NY, daughter of the late David and Anne Heffernan. Carol grew up in New York City and in 1960 married Edward Mendonca. Edward was in the U.S. Navy for 30 years so they made their home in California, Tennessee and Rhode Island before settling down in Bethel, CT where they raised their three loving sons. Carol was a homemaker and enjoyed reading, knitting and spending time with her family. Carol will live on in the loving memories of her spouse Edward and her children: Lawrence and his wife Michelle of Danbury, CT, Lance and his wife Elizabeth of Bethel, CT and Paul and his wife Jamie of Brookfield, CT. She will also be fondly remembered by her seven grandchildren: Elizabeth, Jonathan, Joseph, Tyler, Brian, Nicole and Matthew, her siblings, Robert Heffernan and his wife Peggy, John Heffernan and his wife Marianne, Anne Rita Conboy, Estelle McNerney, Mary Catherine Rademaker, as well as many nieces and nephews. Carol was predeceased by siblings Joan Skehill, Richard Heffernan, Patricia Book, Ellen Chanowsky, and David Heffernan. Friends and family will be received on Thursday, November 15, 2018 from 7:00 p.m. to 9:00 p.m.at Bethel Funeral Home, 215 Greenwood Ave, Bethel, CT.
A Mass of Christian Burial will be celebrated on Friday, November 16, 2018 at 10:00 a.m. at St. Mary's Church, 26 Dodgingtown Rd, Bethel, CT. In lieu of flowers, donations in Carol’s memory can be made to St. Jude Children’s Research Hospital.